Sister Mary Finnick (Sister Saint Patricia) was the first Grey Nun of the Sacred Heart to minister in Haiti. She was also the first Grey Nun of the Sacred Heart to teach at the University of Buffalo and the first to teach at Temple University. Sister Dolores Fitzpatrick (Sister Claire Marie) was one of the first Grey Nuns of the Sacred Heart to teach at the newly-built St. Mary’s School in Potsdam, New York. 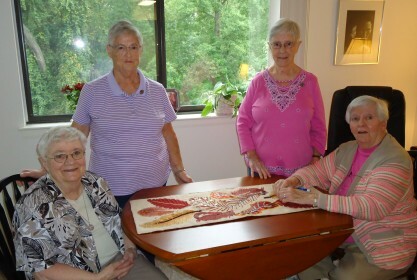 Both sisters are flexing their pioneer muscles once more as two of the first four sisters to move from the Motherhouse into Holy Redeemer Lafayette, an independent retirement facility in northeast Philadelphia. Holy Redeemer Lafayette is owned and administered by Holy Redeemer Health System. Sister Mary is sharing a small apartment with Sister Pierrette Remillard (Sister Marie Jerome). Sister Dolores is sharing an apartment with Sister Mary Mulligan (Sister Martin de Porres). The sisters’ apartments are across the hall from one another. “We felt at home, right away,” Sister Pierrette adds. In their new home, the sisters enjoy the benefits of programs for physical exercise and mental stimulation. They share dinner with their sister—and fellow–residents, people of all faiths. There is a small chapel, where Sister Dolores can often be found, praying in the silence, during the day. “I feel at peace here,” she observes. Mass is celebrated three times a week and as more Grey Nuns of the Sacred Heart settle in, the sisters will form community life, including communal prayer. We invite you to partner with us in caring for our aging Sisters who gave without counting the cost. Click here for ways to donate. Thank you in advance for your support! St. Michael, ND on the Sioux Reservation. I believe that would be one of the Canadian branches of Grey Nuns, possibly the Montreal Grey Nuns. We all claim St. Marguerite D’Youville. We are the only USA branch of Grey Nuns. There are five branches in Canada. I’m so glad your experience of the sisters was a good one for you. I think the Grey Sisters of Pembroke also worked with native people but don’t think they were in the US. Do you have a e-mail address so I can mail my cousin, Sister Mary Finnick, who I saw in Report to Donors.